“I’m going to Skopje this week,” I excitedly tell one of my Greek colleagues. Her immediate reaction is: “Why?” And herein lies the first challenge in going from Greece to Macedonia — explaining your destination without triggering a political debate. Although growing up I spent my summers with family in Greece, it was only when I moved to Thessaloniki (in the Greek province of Macedonia) that I first encountered the novel local way of entirely sidestepping the name of their ex-Yugoslav neighbour to the north: “Skopje” is used as a catch-all term. The long-standing dispute regarding the use of the name “Macedonia” has seen Greece block Macedonia’s accession to the European Union and NATO — and it was the question that sat in the back of my mind as our bus trundled across the border. After following the Vardar River north past rolling hills clad in autumn colours and a pitstop in Veles (which recently gained fame as Macedonia’s “fake news factory”) you have to resist the temptation for a quick break at one of the many wineries advertised en route. At the top of my agenda upon arrival was lunch. What happened next at the old bazaar’s cosy Serdarot restaurant might best be described as a “grilled meat extravaganza”: traditional kebabs with the tangy sweetness of ajvar red pepper and aubergine relish and a shopska salad laden with sirene cheese. When we were once again able to stand up, we found ourselves on the southern fringe of the largest bazaar in the Balkans — Skopje’s trading centre since at least the 12th century. A maze of small streets packed with cafes and jewellery shops interspersed with rather more everyday businesses (haberdasheries, bakeries, hardware shops), the bazaar draws you through its cobbled lanes and passageways by way of its statuesque, yet delicate, minarets. These act like gentle beacons, hinting at the beauty and grandeur around the next corner: the rose garden of the Ottoman-era Mustafa Pasha Mosque, the Suli An caravanserai-turned-arts-centre with its secluded courtyard and archways and the 13 domes of the Daut Pasha Hamam, which is now home to the National Gallery. 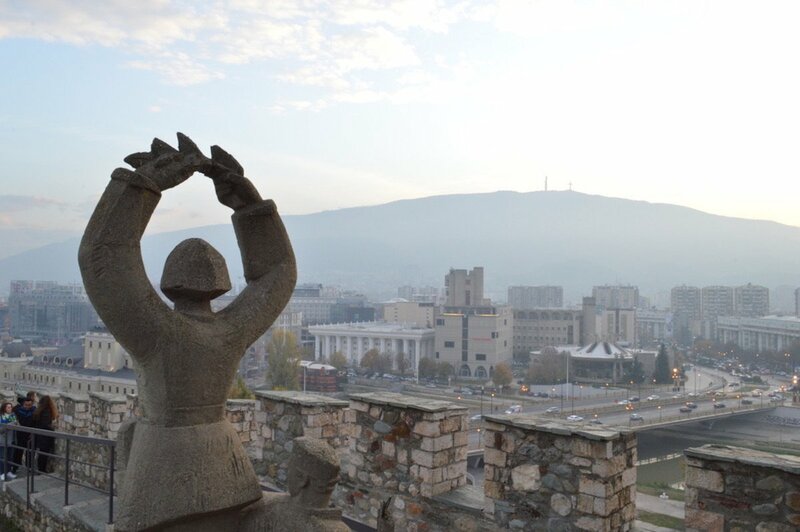 A short walk up from the bazaar stands the Skopje Fortress. A stately presence on the city’s skyline, what the sixth-century fortress lacks in signage and historical information it makes up for in views across the Vardar River. 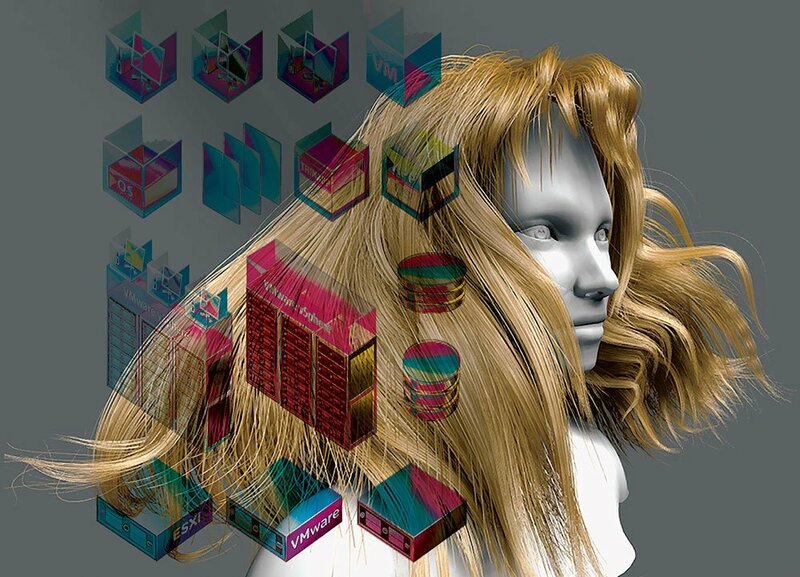 It looks down towards the city’s more recent attempts to connect with, and shape, its past: the banks of the river have birthed a controversial classical era, which saw its dawn in 2014. Alright, strictly speaking, this new era began in 2010 when the government announced a grand plan for the capital become a haven of neo-classical splendour and an homage to the great heroes of the historical Macedonian region. Perhaps unsurprisingly, Skopje 2014 is still incomplete. Costs have skyrocketed, with the price tag — initially envisaged as 80 million euros — now estimated to be up to 500 million euros. But it’s not only the cost that has raised eyebrows. Many see the project as part of the former nationalist VMRO-DPMNE government’s policy of “antiquisation”, which looks to place ancient figures such as Alexander the Great and Philip II of Macedon within the national narrative to both build identity and bring in tourists. But for critics, the effect of erecting grandiose government buildings, hundreds of statues and giving the facades of many existing buildings a neoclassical makeover is more nationalistic historicist kitsch than tasteful urban renewal. At the centre of it all on Macedonia Square is a 28 metre-high monument. Warrior on a Horse is generally understood to represent Alexander the Great — you can, after all, arrive in Skopje at the Alexander the Great Airport or on the Alexander the Great Highway. This did not go unnoticed by my Greek travel companions, who had thought hard about whether to make the journey to Skopje, fearing reprisals from disapproving family members. But as they remembered the Alexander the Great statue on the Thessaloniki seafront, they may have taken comfort in knowing that Greece isn’t the only country to share landmarks with Macedonia: there’s the miniature Arc de Triomphe (Porta Macedonia) on Pella Square, giving the place a touch of the Las Vegas. In light of this nod to Paris, it seems reasonable that former Prime Minister Nikola Gruevski’s attempt to create a Macedonian identity that appeared to overlook large swathes of the population caused anger. In its original form, the project, with the exception of a statue of Skopje native Mother Teresa (whose Memorial House you can visit), had little acknowledgement of the country’s large Albanian population. After protests, depictions of ethnic Albanians, including writer Pjetër Bogdani, were included in the plans, along with the construction of Skanderbeg Square in honour of a famous Albanian nobleman and military commander. 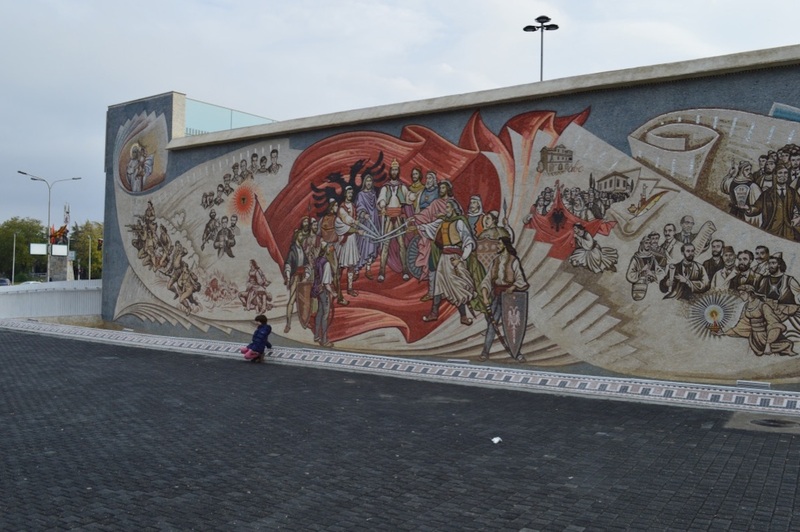 A newly unveiled mural depicts key scenes from Albanian history, featuring freedom fighters and intellectuals, with the Albanian flag providing a backdrop. Foreign Policy magazine has suggested that, should Macedonia need to choose another name, it could consider “Land of Ostentatious and Ripped-Off Monuments”. I may or may not have chuckled on first hearing this (I definitely did), but on reflection my laughter was uncharitable. 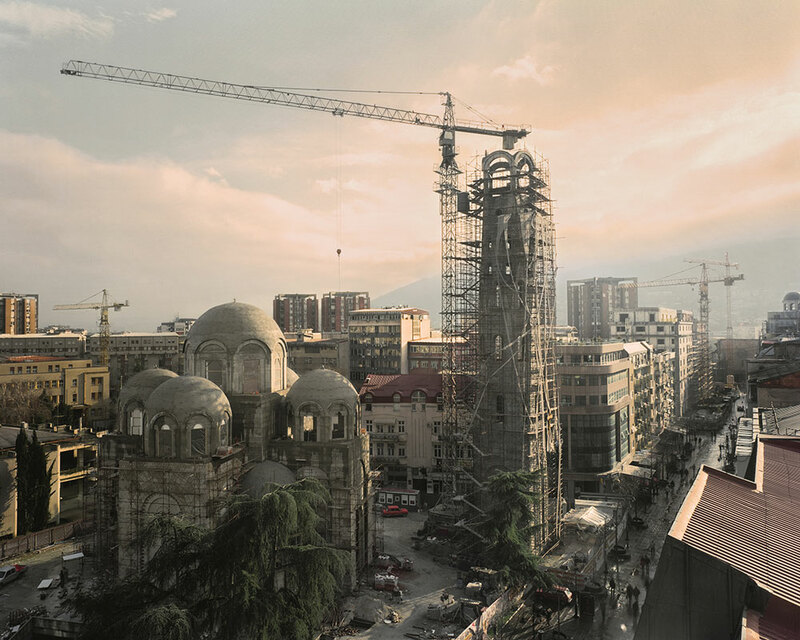 In 1963, Skopje experienced a devastating earthquake that destroyed almost 80 percent of the city. 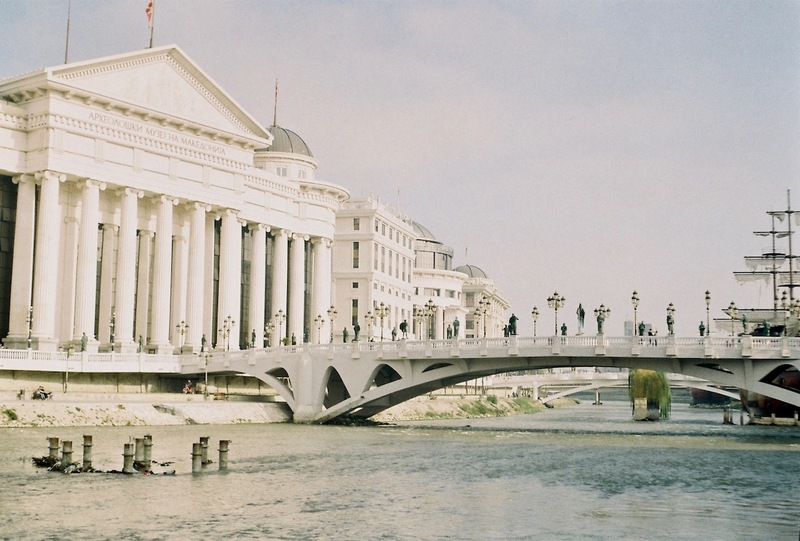 Along with killing more than 1,000 people and leaving over 200,000 homeless, the earthquake destroyed Skopje’s neoclassical buildings and paved the way for concrete brutalism under the creative vision of Japanese architect Kenzo Tange. 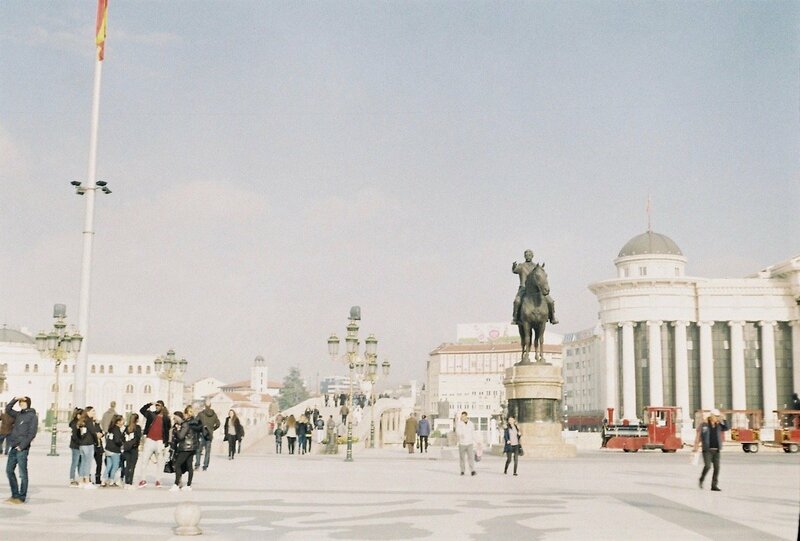 For some, Skopje 2014 represents a visual statement of progression, away from the stark socialist architecture of the Yugoslav era and towards a Skopje that is decidedly Macedonian. Herein lies the pitfall. 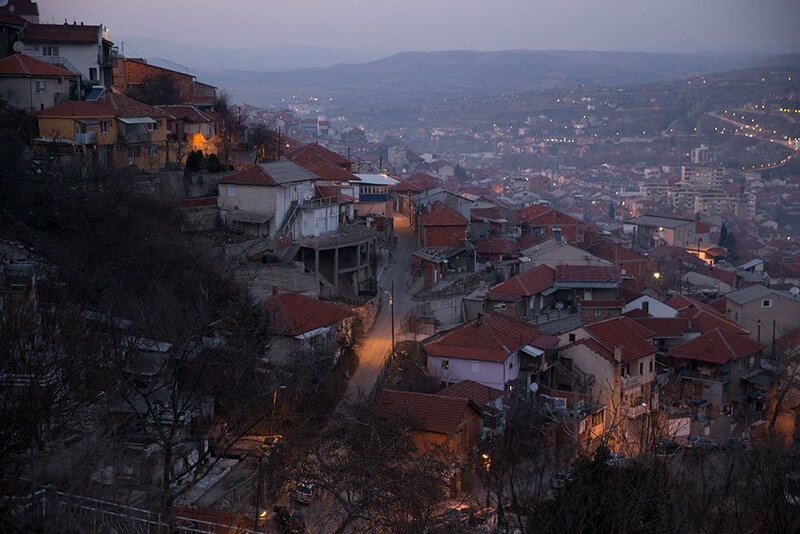 Since the breakup of Yugoslavia in the early 1990s, Macedonia — a relatively small piece of land with a population of just over 2 million — has struggled to forge a new identity. 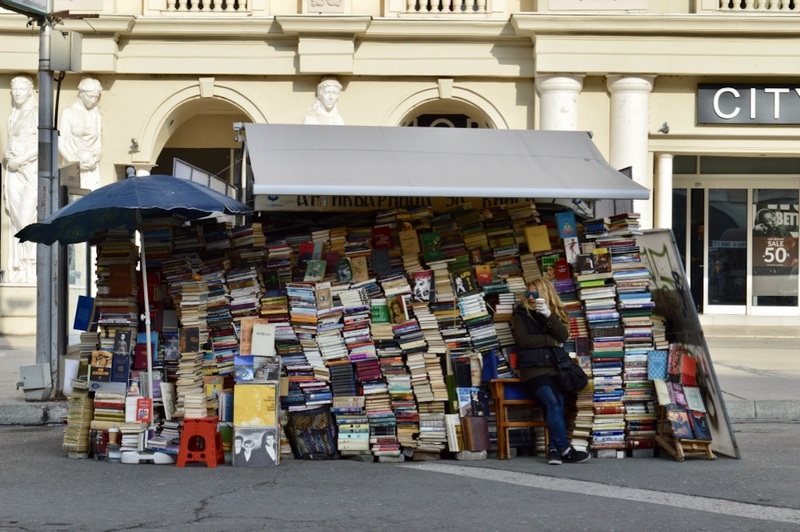 On top of difficulties typical for newly independent countries emerging from communism, Macedonia exists only in quotation marks, held hostage and in a state of permanent transition by the refusal by some to accept its (rightly or wrongly) assumed identity. In its slow journey towards integration with the global community, Macedonia has been asked to reconsider its sense of self; its membership of the EU and NATO hangs in part on this very demand. That is not to say that the Macedonian government is entirely innocent, or that we should equate government demands with the will of the people. But knowing it is the population of Macedonia that is held back by this cold war gives me pause for thought. Take, for example, the devastating trade embargo Greece imposed on Macedonia in 1994 over its use of the Vergina Sun on its flag — who bore the brunt of this punishment? If nothing else, learning of such things has given a new, sadder spin to the “Macedonia is Greece” signs I see in Thessaloniki. Wherever you are in Skopje, your eye is drawn upwards to the Millennium Cross, which overlooks the city from atop the Vodno mountain. 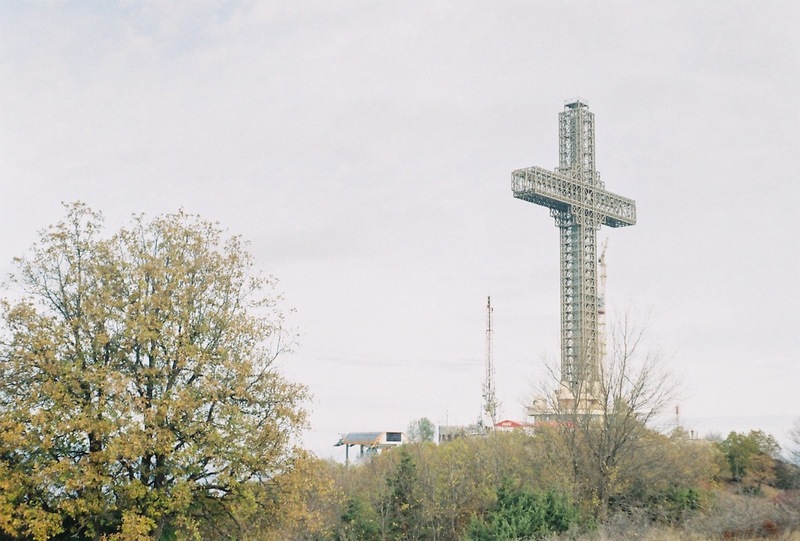 The 66 metre-tall cross, built to mark 2,000 years of Christianity in Macedonia, is emblematic of much that we have seen of the city’s recent development: imposing, extravagant and divisive. In May this year, Macedonia’s new government announced plans to bring Skopje’s makeover to a halt in the midst of spiralling costs and accusations of both poor taste and a lack of transparency. A shortlist of statues set to disappear includes the aforementioned Warrior on a Horse, an inflammatory pawn in the country’s relations with Greece. I just have to wonder: whose triumphant monument will we see on the square the next time we visit Skopje?